We suspect you’re like many of us who could use a bit of positive news after the horrific events in New Zealand. So here’s a little reminder that kindness and empathy are still human virtues. But now, CNN reports, thanks to an unexpected act of kindness from a train conductor, she can at least take the train ride free of charge. 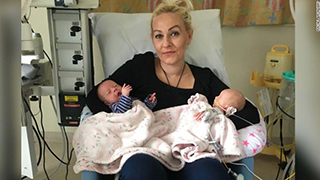 Broadway, who lives in Retford, in the British Midlands, gave birth to twins Ocean and Odin at Sheffield Teaching Hospital about 12 weeks before their due date. While baby Odin was fine, his sister developed a serious condition known as necrotizing enterocolitis (NEC), an intestinal illness common in premature babies. During one of the daily train trips, a conductor who frequently works the route asked Broadway why she was travelling so often with her son. Broadway said she managed to find the conductor, Emma Abel, on Facebook. She thanked her personally for her act of kindness. She would spend up to 30 pounds ($45) a day on the two-hour, 110 km round trip, which put a significant financial strain on her family. "My partner had to give up work so that I can go hospital every day while he does school run and looks after our one-year-old," she said.